Ok the first one of these movies was bad but making a sequal is going to far. One the other hand it had nothing to do with it's predecessor. The first 1/2 an hour is all spoken in an African language and isn't subtitled. It is impossible to tell what anyone is saying and after about 30 seconds you stop caring. The "alien effects" were done by smearing vasaline on the camera when ever they filmed Nebula (the bad guy). 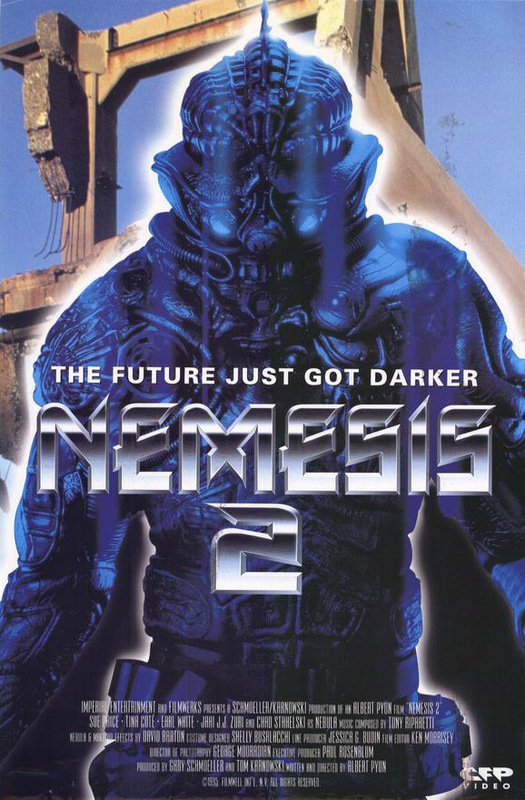 The only thing worse than this movie was Nemesis 3 which was pretty much just footage from the second one scrambled out of order. I think they were supposed to be flash backs. The only notable thing about this movie is it had a member of the production crew with the unfortunate name Yolanda Squatpump. Bodybuilder Sue Price plays Alex, a girl who grew up in an African tribe. Everybody lies to her about her true origins, but once she passes a toughness test and beats her main tribe bully to a pulp, the main man finally lets her see the time machine she came out of 20 odd years ago. Meanwhile a cyborg called Nebula who looks like a cross between The Fly, Predator and the evil alien wife from the Outer Limits episode, zeroes in on Alex and sets on a path of total annihilation. That's how this film starts and it's relatively well made for a video feature. The rest of the movie is non stop Sue running around in little clothing, kicking, stabbing and shooting Nebula and various goons and that's it. But, to Albert Pyun's credit, he's smart enough to blow up as many buildings as he can on camera. What this movie lacks in plot, and it really does lack in plot, it makes up for with explosions. And Sue Price, who's quite feminine looking despite being ripped as hell.